You can always count on the designers at the Christopher Radko studios to come up with new winners each holiday season! The ABC Santa Christmas ornament is perfect for kids and collectors of top-quality Santa ornaments personalized by the artisans who craft them. The jolly one is sitting on a stack of kid's blocks with a bag of goodies behind and a precious teddy on his lap ready for giving to a good little boy or girl. These Radko ornaments are created entirely by hand from European blown glass- hand-painted too - to create heirloom ornaments that really are a cut above. 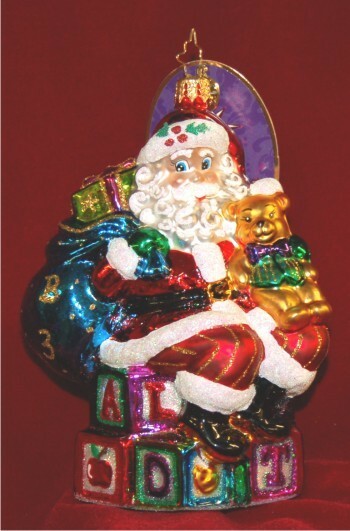 Select one of the jolliest Christopher Radko ornaments around, the ABC Santa glass Radko Christmas ornament in beautiful style and color.